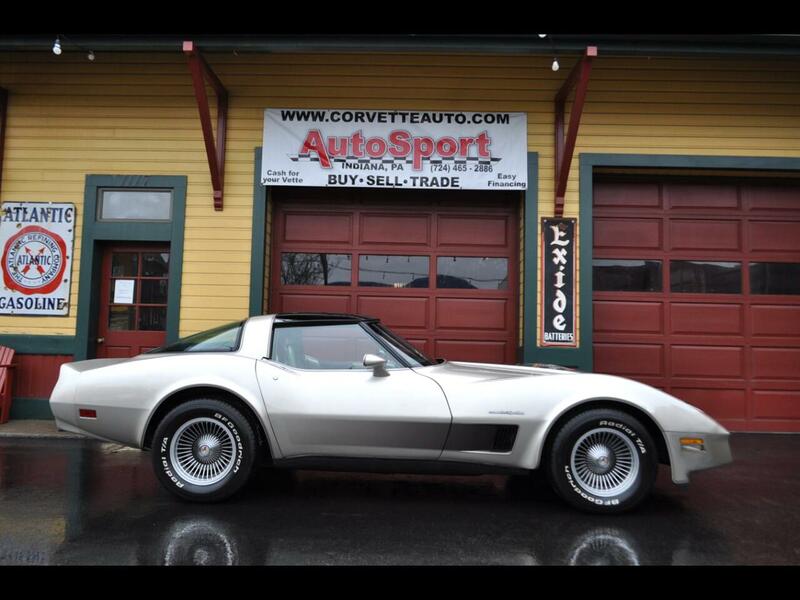 Used 1982 Chevrolet Corvette 1982 Collector Edition 5023 Org Miles!! for Sale in Indiana PA 15701 AutoSport Co. Trim: 1982 Collector Edition 5023 Org Miles!! For Sale is an original 1982 Collector’s Edition Corvette with 5023 Original Miles!! This car is in exceptional condition and is all original! This is a 2 owner car that has documented miles and a copy of the original title. The Silver Beige paint is all original and is in show quality condition. The exterior of this car is in exceptional condition with the original rubber bumpers on the car. The original Collector Edition stripping is in excellent condition. The factory Commemorative Aluminum wheels are like new and they have 4 brand new tires on them. They replaced the original tires due to dry cracks and age. The Mirrored T-Tops are beautiful in excellent condition. The cloisonné interior is all original and is in exceptional condition. The leather seats are like new. The upgraded plush carpet is like new. All the gauges work even the clock. The interior is one of the most unique features for the Collectors Edition model and this car has one of the finest original examples I have ever seen. The cigarette lighter has never been used or the ash tray! The undercarriage is in excellent condition. The original stickers from the factory are still on both the half shafts and the drive shaft. There are factory tags on both sets of springs on the front suspension. There are 2 pictures of the factory Stencil marks and number on the frame and on the body. The original exhaust system is still on the car and these cars are hard to find with a clean functional original exhaust system. The original spare tire is in the carrier. This car comes loaded from the factory with almost every option you could order except a CB radio and heavy-duty cooling. This is a real deal original Corvette with extremely low miles and it’s a corvette on the rise in value and prestige. Please feel free to call or email us with any questions at 814-977-9219 or email us. For Sale is an original 1982 Collector’s Edition Corvette with 5023 Original Miles!! This car is in exceptional condition and is all original! This is a 2 owner car that has documented miles and a copy of the original title. The Silver Beige paint is all original and is in show quality condition. The exterior of this car is in exceptional condition with the original rubber bumpers on the car. The original Collector Edition stripping is in excellent condition. The factory Commemorative Aluminum wheels are like new and they have 4 brand new tires on them. They replaced the original tires due to dry cracks and age. The Mirrored T-Tops are beautiful in excellent condition. The cloisonné interior is all original and is in exceptional condition. The leather seats are like new. The upgraded plush carpet is like new. All the gauges work even the clock. The interior is one of the most unique features for the Collectors Edition model and this car has one of the finest original examples I have ever seen. The cigarette lighter has never been used or the ash tray! The undercarriage is in excellent condition. The original stickers from the factory are still on both the half shafts and the drive shaft. There are factory tags on both sets of springs on the front suspension. There are 2 pictures of the factory Stencil marks and number on the frame and on the body. The original spare tire is in the carrier. This car comes loaded from the factory with almost every option you could order except a CB radio and heavy-duty cooling. This is a real deal original Corvette with extremely low miles and it’s a corvette on the rise in value and prestige. Please feel free to call or email us with any questions at 814-977-9219 or email us.